Need more? Additional stock arriving in 3 - 5 weeks, order now. Heal's made its name as a furniture maker through the Arts and Crafts movement of the late 19th century and the Blythe range has been designed to capture that same ethos of functional, quaker inspired furniture. Designed and developed in-house, the practical Blythe Coffee Table is made from solid oak and oak veneer that has been finished in a clear matt lacquer to protect the wood while also providing a smooth finish. Inspired by Heal’s heritage, subtle design details such as the lipped top, sturdy base and arched silhouette demonstrate the craftsmanship at the heart of the range. Inspired by Heal’s Arts and Crafts heritage and taking it's name from London's iconic Blythe house. New addition to the Blythe Range. Features spacious shelf for storage. Fits perfectly alongside the rest of the Blythe range. Expertly designed to create a robust frame with convenient storage shelf. 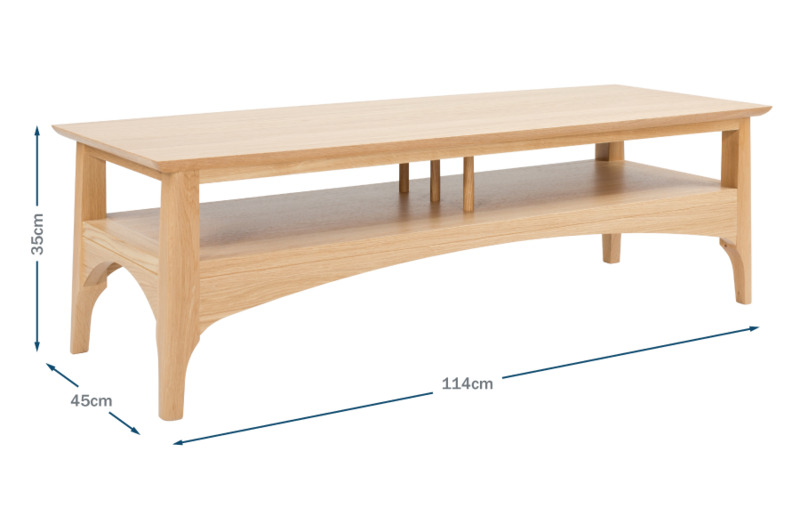 Table made from solid oak and oak veneer for a traditional feel.